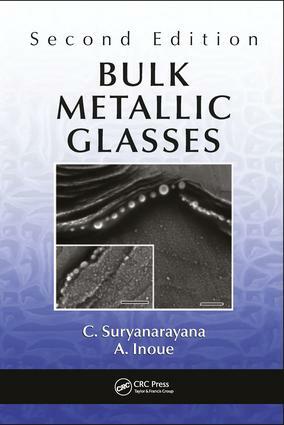 Reflecting the fast pace of research in the field, the Second Edition of Bulk Metallic Glasses has been thoroughly updated and remains essential reading on the subject. It incorporates major advances in glass forming ability, corrosion behavior, and mechanical properties. Several of the newly proposed criteria to predict the glass-forming ability of alloys have been discussed. All other areas covered in this book have been updated, with special emphasis on topics where significant advances have occurred. These include processing of hierarchical surface structures and synthesis of nanophase composites using the chemical behavior of bulk metallic glasses and the development of novel bulk metallic glasses with high-strength and high-ductility and superelastic behavior. New topics such as high-entropy bulk metallic glasses, nanoporous alloys, novel nanocrystalline alloys, and soft magnetic glassy alloys with high saturation magnetization have also been discussed. Novel applications, such as metallic glassy screw bolts, surface coatings, hyperthermia glasses, ultra-thin mirrors and pressure sensors, mobile phone casing, and degradable biomedical materials, are described. Authored by the world’s foremost experts on bulk metallic glasses, this new edition endures as an indispensable reference and continues to be a one-stop resource on all aspects of bulk metallic glasses. "This book is notable for its lucid style as well as its comprehensive and systematic coverage of the field of bulk metallic glasses. The topics have been chosen carefully and systematically arranged. This makes the reader rapidly grasp the principles and applications of bulk metallic glasses. The field has attracted a number of books, but they are all edited volumes with multiple authors and lack the focus and coherence of this volume. The book by Suryanarayana and Inoue is definitely a classic." "The second edition of Bulk Metallic Glasses provides an indispensable resource on glassy alloys which are at the forefront of contemporary advanced materials. The authors, who are world leaders in the field, are uniquely qualified to provide the balance of breadth and depth of coverage that is valuable to both researchers active in the field as well as those entering the area." C. Suryanarayana, PhD, is Professor in the Department of Mechanical and Aerospace Engineering at the University of Central Florida in Orlando, Florida. He has conducted research investigations in the areas of rapid solidification processing, mechanical alloying, innovative synthesis/processing techniques, metallic glasses, superconductivity, quasicrystals, and nanostructured materials for almost 50 years and has concentrated his research efforts on bulk metallic glasses and mechanical alloying and milling for the past 20 years. He has published more than 380 technical papers in archival journals and authored/edited 9 books and 12 conference proceedings. Earlier, he was a Professor of Metallurgy at Banaras Hindu University in Varanasi, India. He held visiting assignments at the University of Oxford, Oxford, United Kingdom; the Atomic Energy Center in Mol, Belgium; the Wright-Patterson Air Force Base in Dayton, Ohio; the University of Idaho in Moscow, Idaho; the Colorado School of Mines in Golden, Colorado; the GKSS Research Center in Geesthacht, Germany; the Helmut Schmidt University in Hamburg, Germany; Tohoku University in Sendai, Japan; the National Institute for Materials Science in Tsukuba, Japan; Chungnam National University in Taejon, Korea; Shenyang National Laboratory for Materials Science in Shenyang, China; and Northeastern University in Shenyang, China. Most recently, he was selected a Jefferson Science Fellow by the U.S. National Academies and served as a Senior Science Advisor in the U.S. Department of State in Washington, D.C. Professor Suryanarayana is on the editorial boards of several prestigious materials science journals. He has received several awards for his research contributions to nonequilibrium processing of materials, including the Young Scientist Medal of the Indian National Science Academy, the Pandya Silver Medal of the Indian Institute of Metals, the National Metallurgists Day Award of the Government of India, the Distinguished Alumnus Award of Banaras Hindu University, and the Lee Hsun Research Award from the Chinese Academy of Sciences. He was also awarded the Lifetime Achievement Award in Engineering by the Central Florida Engineers, and the Lifetime Achievement award in Electron Microscopy by the Electron Microscope Society of India. Thomson Reuters has announced in 2011 that Professor Suryanarayana was one of the top 40 researchers in the field of materials science in the world who achieved the highest citation impact scores for their papers published since January 2000. Most recently TMS, the premier materials society of the US, has awarded him the 2016 Educator Award. He is a Fellow of ASM International, Institute of Materials, Minerals and Mining, London, United Kingdom, and the Electron Microscope Society of India. He earned his BE in metallurgy from the Indian Institute of Science, Bangalore, and his MS and PhD in physical metallurgy from Banaras Hindu University, Varanasi, India. A. Inoue, PhD, is an Emeritus Professor, Tohoku University and has conducted research investigations on rapidly solidified glassy alloys; nanocrystalline alloys for engineering applications; iron and steel metallurgy; metallic glasses; superconductivity; and synthesis, characterization, and commercialization of metallic glasses in general, and bulk metallic glasses (BMGs) in particular. He has pioneered the field of BMGs through systematic synthesis, characterization, and applications for the past 25 years. He has published more than 2000 papers in archival journals and edited several conference proceedings and books. He also holds over 200 patents and has been a member of the editorial boards of several archival journals. Professor Inoue was the President of Tohoku University in Sendia, Japan, during 2006-2012. Currently, he is a Professor and Special Adviser to the Chancellor, Josai University, Tokyo, Japan, and Director of the International Institute of Green Materials, Josai International University, Togane, Japan. Since 2013, he has been the 1000 Talented Invited Professor at the School of Materials Science and Engineering, Tianjin University, Tianjin, China, and from the beginning of 2017 he has been the Special Invited Professor, Director, Institute of Massive Amorphous Metal Science, Chinese University of Mining Technology, Suzhou, China. Professor Inoue held visiting assignments at the Royal Institute of Technology, Stockholm, Sweden; the Swedish Institute of Metals Research; AT&T Bell Laboratories, Murray Hill, New Jersey; and the Institute für Forschung Werkstoff (IFW), Dresden, Germany. He was awarded honorary doctorate degrees from the Swedish Royal Institute of Technology, Stockholm, Sweden, and from Dong-Eui University, Busan, Korea, and from the Shanghai Jiao Tong University, Shanghai, China. He was appointed a Fellow of Churchill College, University of Cambridge, Cambridge, UK. He holds honorary professor positions in several prestigious universities. Professor Inoue has received several awards and recognitions for his research contributions. He is a member of the Japan Academy and a foreign member of the U.S. National Academy of Engineering. Some of the most important awards he has received include the Japan Academy Prize (in recognition of his outstanding scholarly contributions to the pioneering development of BMGs), the Japan Prime Minister’s Prize (in recognition of his outstanding Industry–University–Government Cooperation Achievement of BMGs), and the James C. McGroddy Prize for New Materials (in recognition of the development of slow cooling methods for the fabrication of BMGs with remarkable mechanical properties and the characterization and applications of these materials) from the American Physical Society. He was most recently awarded the 2010 Acta Materialia, Inc. Gold Medal. He has also delivered the Kelly Lecture (University of Cambridge, Cambridge, United Kingdom) and the Dr. Morris Traverse Lecture (Indian Institute of Science, Bangalore, India). The ISI has selected him as one of the most cited researchers in the field of materials science and engineering. He earned his BS in metallurgical engineering from the Himeji Institute of Technology and his MS and PhD in materials science and engineering from Tohoku University, Sendai, Japan.